Hip dysplasia is the most commonly diagnosed orthopaedic problem in the growing dog. The disease is multifactorial with breed, lifestyle and diet all playing a part. When medical management and conservative rehabilitation fails to control the pain and disability, the usual option is surgery. The goal of rehabilitation after Total Joint Arthroplasty is the life- long restoration of a pain free functional limb after implantation; minimising complications; increasing function; restoring passive and active range of motion (ROM); increasing strength of the surrounding musculature; restoring function and ultimately improving a patient’s quality of life. Total Hip Replacement (THR) is among one of the total joint arthroplasty treatments at SCVS, rehabilitation starts as soon after the patient arrives from theatre. The main focus of rehabilitation is pain relief, maintaining circulation and joint health. This includes heat therapy, massage and range of movement (ROM). Cold therapy is used to reduce inflammation, heat and a source of pain relief at the incision site. Massage is used to as a way of relaxing and preparing the tissues for passive joint range of movement and stretching. Massage also acts on the nervous and circulatory systems. Passive movements are used to maintain soft tissue extensibility and function of joints when the patient is not using the limb effectively. Milly, an 11 month old lively young Springer Spaniel had been placed in a crate with sedation for a week, however when the owners of Milly removed her from the crate she would spin and jump. Millie was brought to the physiotherapy department at 14 days where upon it was discovered she had a luxated hip. AT the 2nd discharge post op it was decided she should not be placed in a crate and allowed to start going for short walks regularly with a harness and band to control her behaviour. Often at the initial consultation at around 14 days, many owners have questions about how to minimize complications. The rehabilitation department advise and discuss ways of mitigating risk factors, these include modifying home environments; different ways controlling the unruly, sometime not well socialised canine. 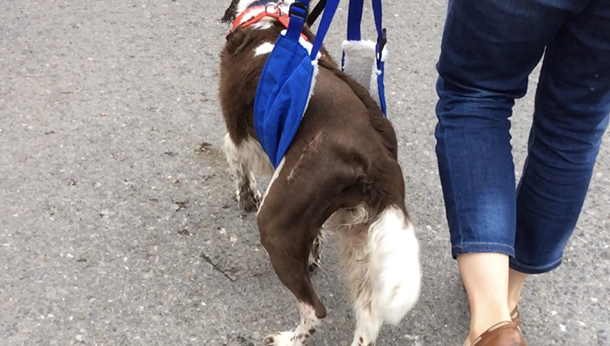 One of the ways of minimising risks when patients are being walked slowly is the use of a harness and a belly band. The additional support of the band prevents falls in the early stages. Milly’s gait pattern revealed a shortened stride length and compensatory movements were evaluated, because Milly had received 2 surgical procedures she had developed some tissue tightness limiting hip joint motion. Milly’s gait demonstrated significant external rotation and abduction from the hip and paw positioning was lateral, there was also and some lumbar side bending. Milly was not however easy to observe as she wasn’t used to walking on a lead so tended to pull in all directions. When standing Milly tended to favour the opposite leg, tending to stand with the operated leg slightly cranial. When asked to perform a sit to stand, she sat on her haunches so when asked to stand she pulled herself up using her front quarters. Active hip exercises revealed a reduced flight arc and flexion at the hip was also reduced. This action affected how Milly stepped over raised poles, where she struck the poles every time she walked through them. Due to an extended period of non-use of the affected limb, palpation of the muscle groups revealed loss in all muscle groups. Usually when there has been little use of a limb, muscle strength is also deficient. Strength can be tested by lifting the contralateral limb, then observing the contraction of the muscles of the standing leg and whether they able to maintain normal alignment. Range of movement (ROM) assessment and extension of the limb revealed some resistance at the hip joint. The Sartorius and abductor muscles were very restricted and tight. Under normal circumstances Ultrasound would have been applied at the scar tissue unfortunately patient was non- compliant. The Treatment Plan is over a period of several weeks, the following therapeutic exercises are initiated progressively. At 12 weeks post-surgery, final recheck with clinician. Millie had regained full ROM, some increase in muscle mass and strength and a near normal gait mechanics at a walk and controlled trot.